In the racing fraternity, tyre failures are known as driver killers. That is why the problems seen at the British Grand Prix, where four drivers suffered severe blowouts, caused such a concern. There are any number of issues which can prevent a Formula 1 car finishing a race - engine failures, gearbox failures, hydraulics, you name it. They are annoying and frustrating. But there are a few issues that are more serious than that. And tyre failures - like brakes failures - are right up there as being as bad as it can get. It is a really big worry and something urgently needs to be done about it. 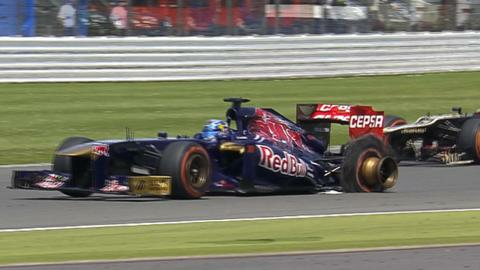 If I was still a driver, I would be very anxious about racing on those tyres again. There is another grand prix this weekend, at the Nurburgring in Germany, and Pirelli may well come up with a solution that sees a different tyre used there. But even if they don't, the drivers will still go out and do it. I remember the last time there was a major tyre worry in F1. It was at the 2005 US Grand Prix and Michelin had a problem with its tyres failing through the long, banked final corner. Michelin worked out that the tyres would almost certainly fail after about 10 laps and decided it had no choice but to withdraw all the cars using its tyres from the race. Only six cars ended up racing that day. I knew it was a major concern - it was a serious fast corner and there had been crashes in practice - but even so I still wanted to race, because as a driver you always think it will happen to somebody else. That's just the way you rationalise it. Silverstone is a particularly demanding circuit on tyres - it's right up there with Spa in Belgium and Suzuka in Japan as the very toughest. There is a high average speed, lots of lateral load in long, fast corners. Nurburgring is not as bad - although it does have some fast corners - but I think everyone realises Pirelli needs to do something. Gary Anderson reported on BBC One after the race that one of the causes of the failures could be the kerb design. The fact is that drivers are able to use the kerbs more these days than they used to just because of the way the circuit design has evolved. "Watching the unfolding dramas of the British Grand Prix, with tyres exploding at high speed on a regular basis, the over-riding emotions were anxiety and alarm - that the drivers' lives were being put at unacceptable risk. "As the dust begins to settle, those feelings are beginning to shift to disbelief at how Formula 1 has managed to get itself into such an unacceptable situation. Some would - and doubtless will - call it a crisis. To many minds, that would not be an exaggeration." I can remember when Silverstone had big, high kerbs, and you stayed away from them - in the same way as you don't touch the barriers too hard at Monaco because if you do you'll crash. The tyres should be tough enough to withstand that, but then Pirelli is in some ways a victim of its own success in producing tyres that 'go off' quickly enough to ensure there are multiple pit stops. Pirelli could easily produce tyres that could do an entire grand prix. In the same way, modern grand prix tracks are a victim of the requirement for them to have multiple uses. Race tracks are businesses and they cannot survive on F1 alone. High kerbs are not good for motorbike racers; flat kerbs are. So there are a number of issues that need to be addressed but in the short term Pirelli needs to look at where the problem is in the tyre. And there are even potential pitfalls there - if they make the sidewall stronger, for example, they will also make the tyre heavier. These problems happened on tyres that featured a new bonding process that was supposed to solve the failures in earlier races and the result is that the failures are more dramatic and more serious. That is a concern but it is not easy to make a tyre, so you have to feel for Pirelli. Look at the racing teams - Red Bull has a car failure with Sebastian Vettel's gearbox malfunction; McLaren's whole season so far has been a failure. All these people are world leaders in their field and they are having a difficult time. You know what they say about people in glass houses. Pirelli can only react in the way it can react. Practice for the German Grand Prix starts on Friday. It could not design and build a new tyre, and have enough of them for the entire field for a whole grand prix weekend, in four days. It will have to take something it already has. Putting that to one side, the British Grand Prix was a really exciting race. The problems led to safety cars, which bunched up the field, and led to great racing, allowing Mark Webber and Lewis Hamilton to come back through the field after their problems. It produced a grandstand finish between Webber and Nico Rosberg and the drama was heightened by Vettel's surprise car failure. One of the most striking aspects of the weekend was that Mercedes were able to compete on level terms with Red Bull at the front on a track that is so demanding of tyres. That suggests they may have solved the problems with heavy tyre usage that have been afflicting them for the last few seasons. But we should be careful about assuming it is all behind them. It was a sunny day at Silverstone on Sunday, but there was a strong wind, which kept the temperatures relatively cool, in F1 terms. Mercedes were a match for Red Bull in those conditions and it was a close race. Will that be the same in slightly warmer conditions? That's a real question. Vettel's problem meant Fernando Alonso was able to reduce his lead, with a trademark fighting drive up from ninth on the grid to finish third, despite Ferrari never being competitive throughout the weekend. It's tough for Alonso. As a driver, he deserves more from his car. Ferrari will be working hard on the next upgrade, but this has been going on for years now, and it does beg the question why they cannot find more performance. You can't doubt Alonso as a driver, but Ferrari need to come up with something or it is going to slip away from them again.